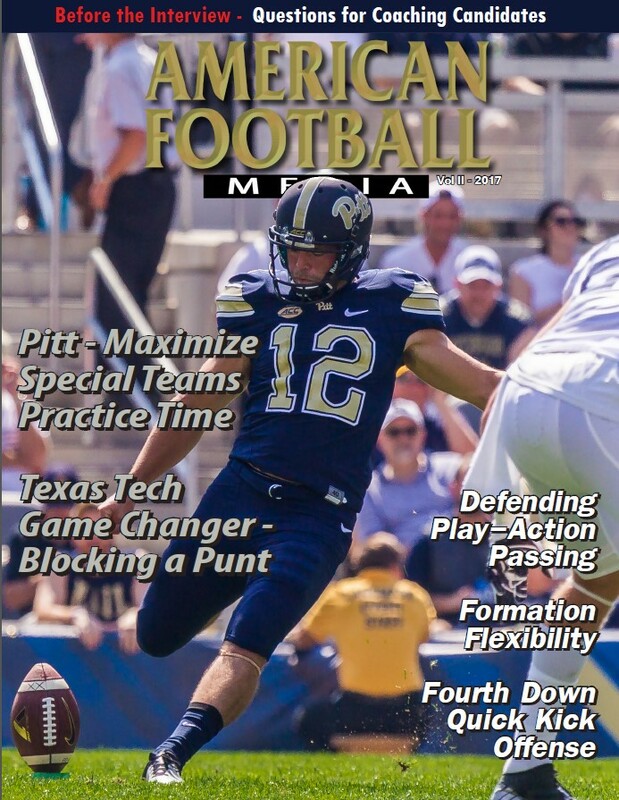 Advanced Pursuit Drills - Teaching the proper pursuit angles should lead to improved tackling. So much of the game is based on speed and agility that everyone is trying to match player against player. But the proper technique of playing the angles and keeping the ball on the appropriate shoulder is critical. The importance of correct pursuit angles will lead to better tackling skills and mechanics. This is very important when we talk to our players prior to introducing these pursuit drills. 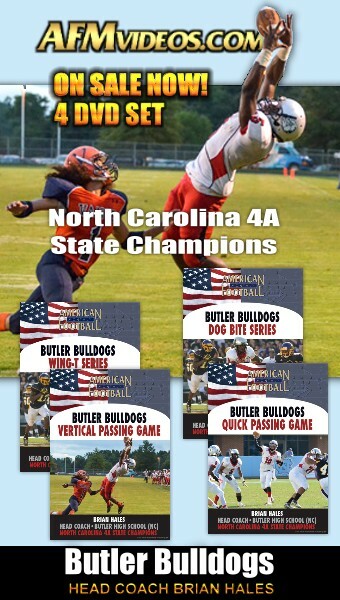 We will introduce and do all of these drills in fall camp and again in the spring. As a season continues, our group periods tend to decrease, which is why we make it a priority to use at least two drills per week beginning on the day after a game and then another on the first full practice of the week. I will explain five different pursuit drills and how we incorporate them on a consistent basis. We try and teach these drills right away so the players know where to go when we move to the drill. The diagrams show the type of equipment that is used. Equipment can be varied between using cones for bags or vice versa. I have found that using proper equipment and having the drills set up gives the athletes a better perception of what the drill should look like. The drills don�t just play a role as a conditioning period and we combine a lot of our fundamentals from our tackling and take-away circuits into the pursuit drills. It is imperative to have all of the coaches involved and make these group periods high-energy periods. Keeping the players focused and in tune to what the drill is about is extremely important. We want to be as efficient as possible with the time we have. In diagram 1, our Group Run Pursuit Drill, we get the players into their positions using bags or cones. We use three different groups instead of having all 11 lined up. The purpose of this drill is to get the players into their positions and, on their movement, they sprint and find the landmarks which are explained to them prior to the start. We emphasize the importance of getting to the correct cone because our base defense must be fundamentally sound at all times. We like that each group can be flying around without the distraction of the other groups. This eliminates them wondering if they are in the right position because of the other players over- lapping the same landmark. As soon as a group is running toward the cones, the next group is already in their positions waiting to go. It is important to have two coaches out in the field encouraging them to sprint and get to the correct landmark. Equipment needed includes 12 cones and five additional cones or bags. In diagram 2, our Four Lane Pursuit Drill, four lines of defensive players will be lined up on the 30-yard line, two on the numbers and two on the hash marks. We usually have the skill players on the numbers and the DL /MLB on the hashmarks. BC will at the 5-yard line. On the command, the defenders will sprint down toward the BC. When the coach gives the BC the signal to go, he can make as many moves as possible to get free. The defenders will not tackle but will thud up to the runner as the other defenders converge to the BC, looking to strip the ball and not allowing a cut back. This drill teaches proper leverage on the ball carrier. We do ask the BC to sometimes reverse his field and run up the sidelines. Only equipment needed for this drill are three footballs. 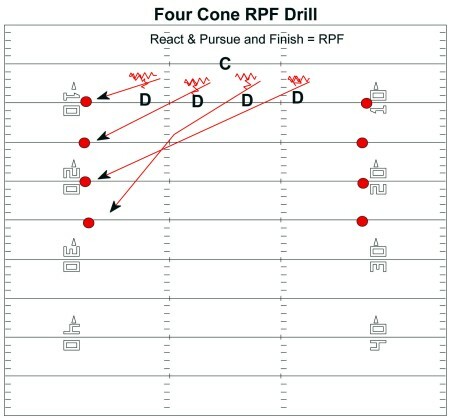 In diagram 3, our Four Cone React, Pursue, and Finish Drill, four defensive players will be lined up on the 10-yard line. On command, the players will run toward the cones while not following the same color jersey. At each cone, the players will either tackle a shield, strip from a pass rush tech, scoop a ball, or recover a ball. This drill teaches pursuit angles while adding fundamentals. Equipment needed includes 8 cones/dots, 8 footballs, and 8 shield bags. 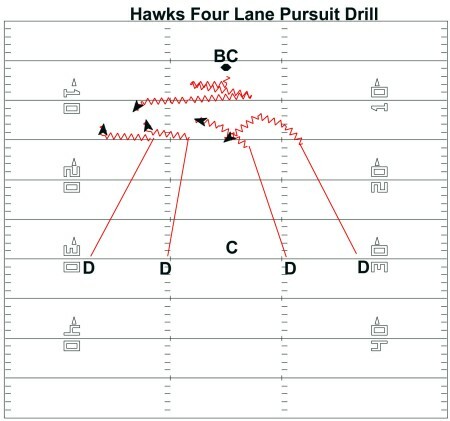 In diagram 4, our React and Pursuit Drill, we are combining reaction and attacking while staying in pursuit lanes. It starts by having four players up by bags or cones waiting for the coach�s command. The players run their feet while waiting for instructions (ground, seat roll, bear crawl, etc.). They then explode off to the next coach. Each coach has three cones set around him. The object is to have each player fit within the proper position (two outside and two inside) of the three cones. Once the players explode out to the first coach with cones, they will approach him in great football position with their feet still moving. They won�t stay longer than a second before they react off the coaches directions on where to go next. They will fit and finish the drill with a break on the coach. If one of the players gets passed by another, he must not follow but fit back into the correct position of the open gap. Equipment needed includes 12 cones and 5 additional cones or bags. 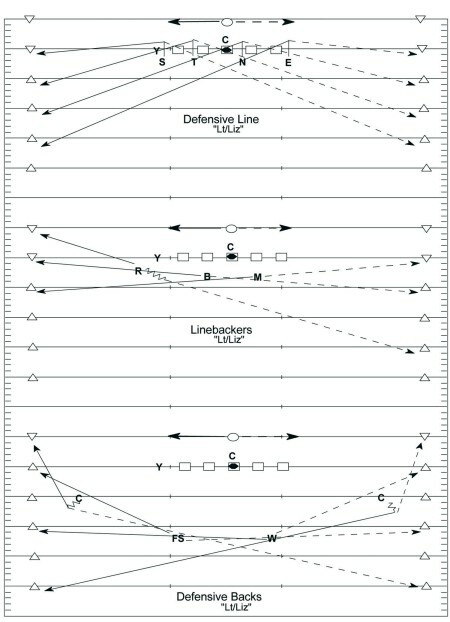 In diagram 5, our Sideline Pursuit Drill, four lines of defensive players will be lined up. Two lines start on the 25-yard line and two on the 40-yard line. On the command, the ball carrier will sprint toward the end zone and can make one move but must stay inside the numbers. The defensive player will not tackle the BC in this drill. He will either thud up if he closes to the BC or he will use the sideline to knock him out of bounds. 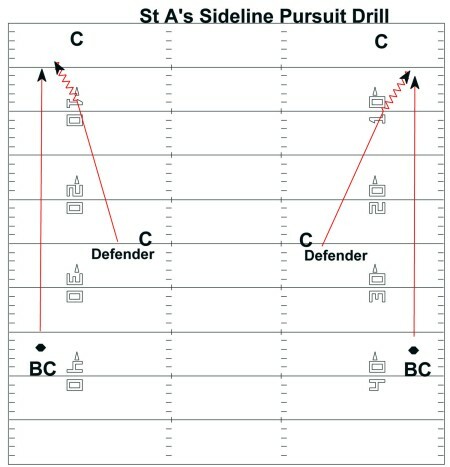 This drill helps the defense develop the correct pursuit angles and speed tempo while the BC is attempting to score. It also helps the ball carrier how to hold the ball correctly while running in open space. About the Author: Rob Eggerling returns for his seventh season as associate head coach and defensive coordinator at Saint Anselm College. He also coached at Hartwick College, the University of New Hampshire and Saint Lawrence University. Eggerling was a four-year letterman at Southern Connecticut State University. He holds a Bachelor�s Degree from SCSU and a Master�s Degree from Saint Lawrence.